Even though I wasn't happy with my Stitch Fix I received this spring, I was thrilled with this Alec Embroidery Detail Top I received. In fact, I think it is one of the best items I ever got from Stitch Fix. It is just totally me: casual, cool, comfy, yet possesses enough detail to make it interesting and somewhat dressy. 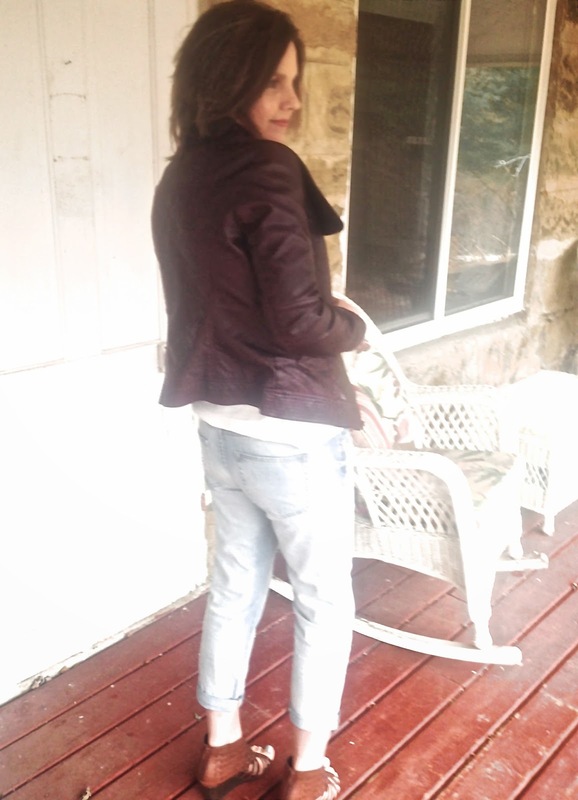 I wore a brown faux leather jacket from Guess (old) when I was outside. The jacket actually has a lot of red undertones in it, making it very rich and warm looking. It also has quite a large collar. My boyfriend cropped jeans are by a.n.a. and purchased from JCP. For jewelry I wore an iridescent shell-type necklace I purchased last year, and a turquoise bracelet I picked up on my trip to Santa Fe last fall. The top is very sheer, and even see-through at some of the open spots, so I have to wear a tank underneath. I really love boyfriend jeans. They are so comfortable in comparison to most other jeans due to their slouchy nature. I had a pair of distressed dark denim boyfriend jeans, but the little hole I bought them with grew into a gigantic hole so I cut them off at the knee and now they are boyfriend shorts. Lesson learned: never buy jeans with holes in them again. I think I only wore them about a half a dozen times before they became so distressed I wasn't comfortable wearing them anymore. From now on I'll put my own holes in my jeans the old-fashioned way: hard work! LOL! 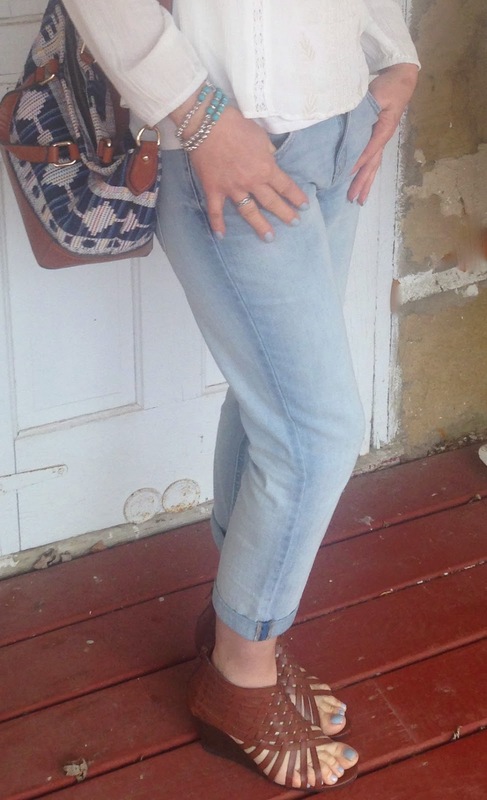 Well, because I needed to replace my old boyfriend jeans, I decided to go light denim and hole-less for spring, and so far, I'm far more pleased with this pair of boyfriend jeans than my last pair. All the snow melted again so I was able to wear open-toed shoes! I picked these up last year at Payless. I really like the way they look with the open weave and the zipper on the heel, but they are quite uncomfortable. My feet tend to slide down the shoe and want to squish out the top, so I only wear them when I know I won't be walking too much. 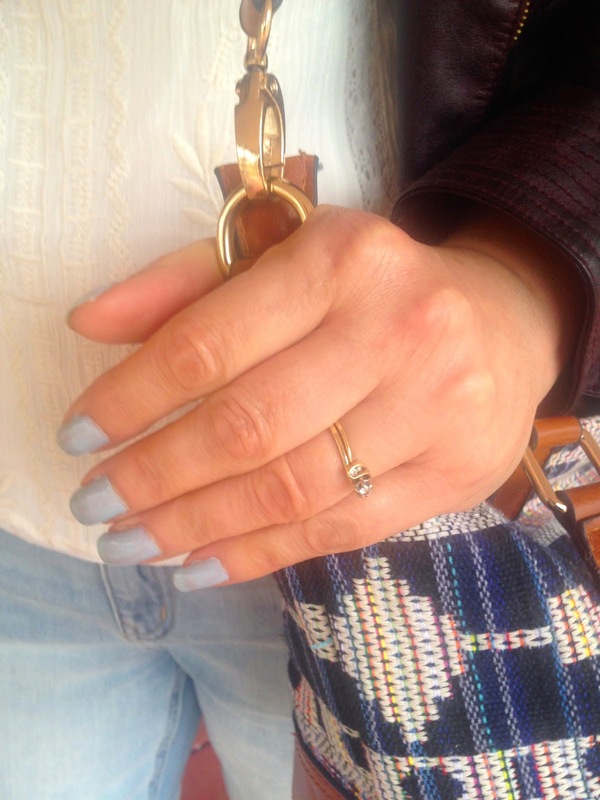 Yes, I painted my nails a robin's egg blue. I think my church ladies friends thought it was weird, but I like it. It's pretty for spring, and it's different from the usual pinks and corals nail polishes you see this time of year. 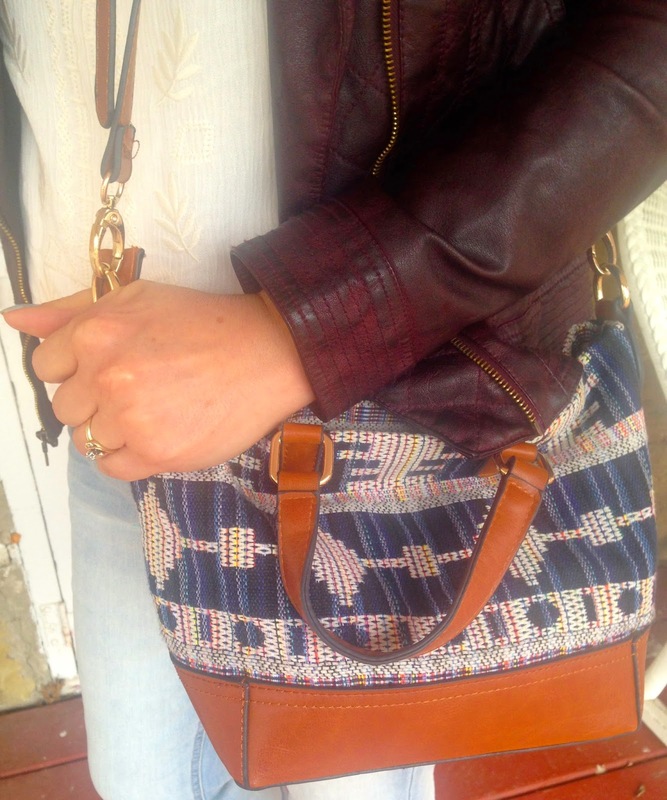 I carried a boho-inspired bag from Francesca's that I purchased last year. Aren't you happy I'm not showing you my Express black bucket bag again? This purse just coordinated so much better with my outfit than the bucket bag. 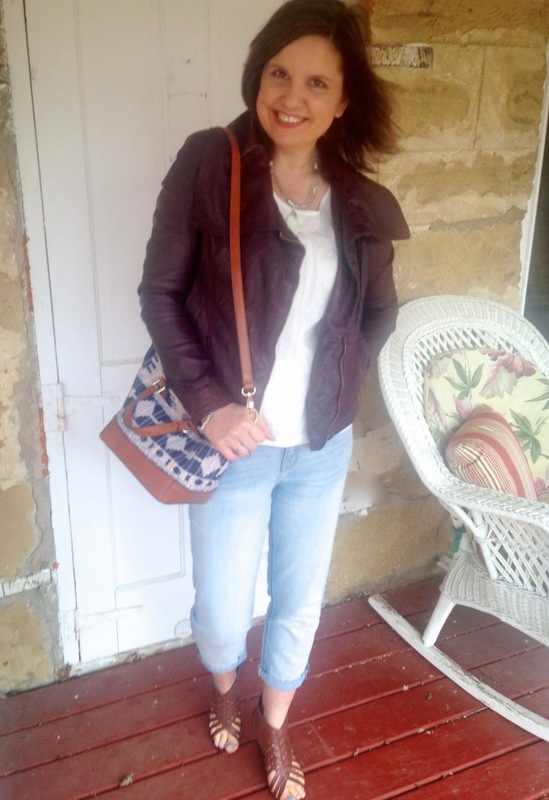 Linking Up with Fun Fashion Friday. Cute top! I love the way you styled it with your light jeans and sandals too. 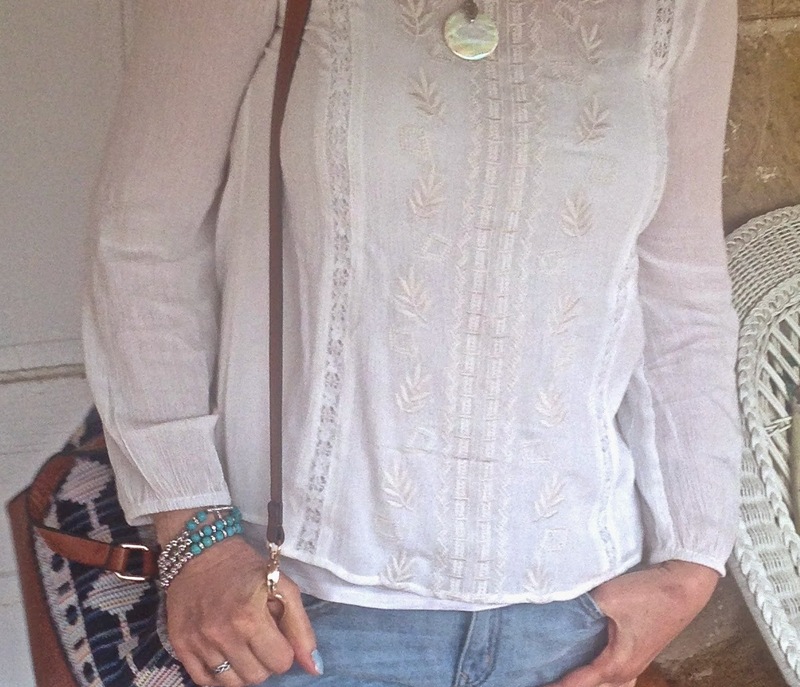 Love that pretty boho blouse! Great shoes for spring too! Have a fun weekend and thanks for sharing with Fun Fashion Friday! 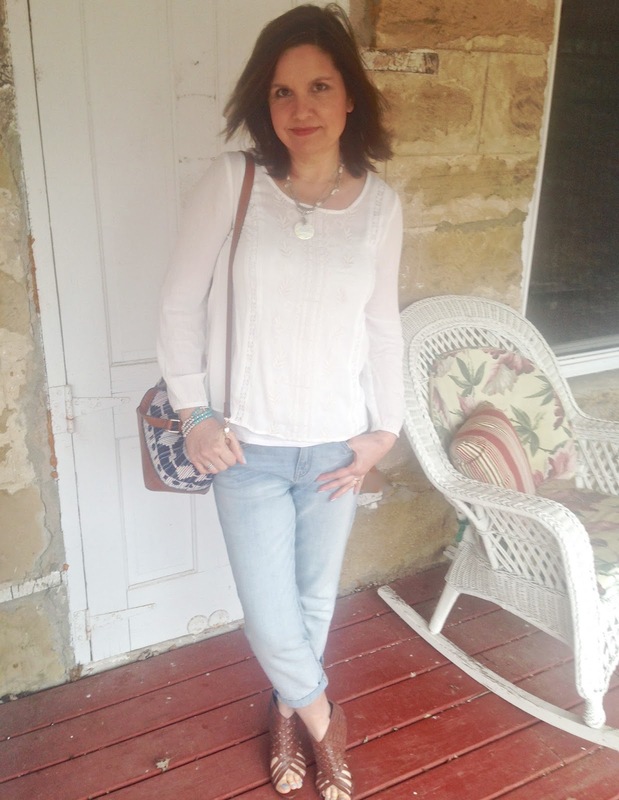 Some of my favorite items in my closet are from Stitch Fix! I just love that company and I need to use them again soon. 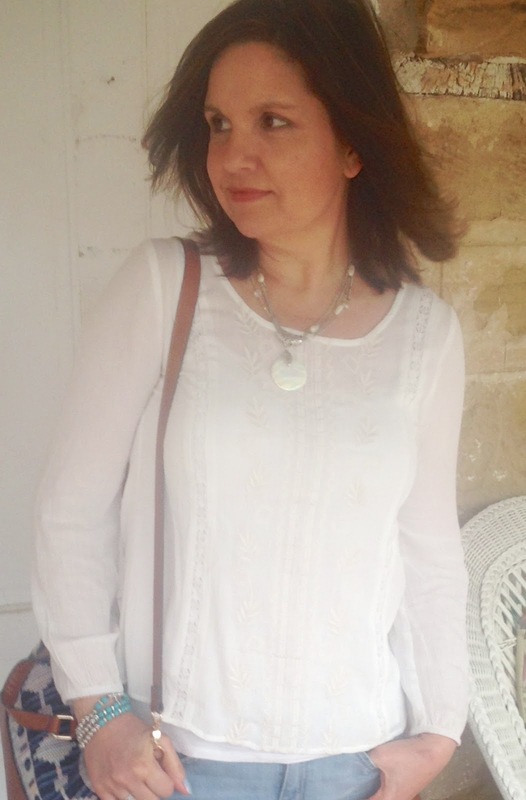 I just love this blouse on you, perfect for spring and so light weight!